When I was in college, I used to drive down this quaint, little street on my way to the whole foods grocery store. In that cute neighborhood, I noticed a brown building surrounded by beautiful flowers with a fenced-in backyard that looked just like a cottage out of a storybook. The sign outside read "Montessori Day and Pre-School"; and at the time I thought, "What's that?" I started doing my research and discovered that "Montessori" is the surname of Italian teacher and child development psychologist, Maria Montessori. Her name is famous world-wide for her innovative teaching techniques that are based on the concept of "following the child". In that, the phrase means to literally cater to the child's mind as it grows and expands developmentally and physically. Montessori schools allow children a wide variety of freedoms while also requiring quite a bit of responsibility. To me, it's sort of the opposite of "tradition" in America (in schools and households, for the most part). Traditionally, (and this could all be only my opinion) children would be given strict guidelines and rules to follow, then they would be taught to stay within those confines on penalty of punishment. In Montessori, the goal would be that the child would naturally develop the ability to see what restrictions to put on themselves through creative problem-solving and reaching out and interacting independently in their environment. As someone who was raised in a strict household and attended an equally rule-based private school most of my younger life, these concepts can seem almost shocking to me at times; however, I am still very much interested in sending our future child/children to a Montessori school. I can see both sides of the story, so to speak, and I am leaning more and more towards Montessori. The best thing is that we even have the option! Dear Hubby and I had already decided to send Baby C. to one of 6 elementary schools within the Catholic school district in a close-by town, only to learn that at least one of them is completely Montessori-based! This was really exciting to us; which prompted the next question, "Should we make her bedroom 'Montessori' as well?" 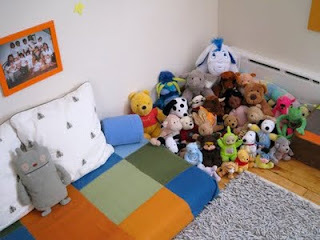 Yes, you can use the Montessori concepts to arrange and decorate your baby/toddler's nursery! So, do I want to try this at home? Some of the concepts have me squirming (like babies sleeping on the floor on a very thin mattress! What about bugs?! ); while many of the others sound amazing! 1. Create a Soft Color Palate: the idea here is that bright, primary colors (including stark blacks and whites) are sensory overload to an infant/toddler. One should keep the room full of soft, inviting pastels or warm neutrals that make the baby feel at ease and free of stress. 2. Subtle Fabrics: fabrics used should match the over-all color scheme of the room to teach the child symmetry (keep the curtains and bedding matching, for example). Texturally, they should be soft and comfortable to the child's touch. 3. Simple Furniture: all furniture should be beautiful yet functional. It's even better if the child him/herself can use the furniture without significant help from an adult (ideally, without any help at all). Over-crowding a room with useless pieces should be avoided at all costs! The whole concept should be that every piece functions together, and every piece matters! 4. Sparse Wall Treatments: anything placed on the wall should be important and purposeful (nice posters of animals or alphabets, or framed works of art, some made by the child?, etc.) and the walls should be kept minimal and uncluttered. Artwork and mirrors (parents are highly encouraged to place mirrors in the child's room so they can watch themselves move physically, whether it be merely learning to roll over and crawl or learning to dance to a rhythm) should be placed at the child's eye-level. 5. 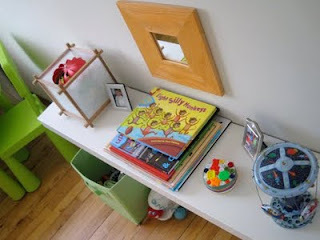 Lots of Organization: again, the idea is to create independence, self-awareness, and a sense of responsibility in a tiny person; so, to encourage the child to put his/her toys away by him/herself at a very early age, the tools all need to be in the right p;lace! So, shelving and boxes and trays should be plentiful and should be located close to the ground; so, they are easily within reach of the child. 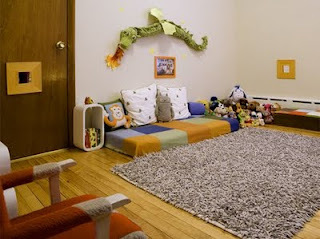 I especially love the idea of there being lots of "stations" in the child's room for different activities. For example, there should always be a small table and chair set with art supplies nearby for the child to create on and with. It would also be good to have an area for them to work with musical instruments and another for books and a nice fluffy pillow to curl up on. 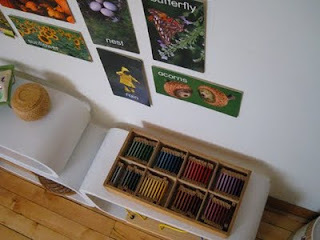 I've seen some really good examples of Montessori baby and toddler rooms, but I recently found some pictures of one that belongs to a little boy named Vincent. I found these pictures of Ohdeedoh.com. I thought this pictures did a really good job of showing what I am trying to explain. Here you can see Vincent's sleeping mat. This is the main thing that I guess "freaks" me out about Montessori rooms, the fact that the child sleeps on the floor; however, my Dear Husband seems completely NOT bothered by this. So, maybe I could get used to this with a little more encouragement from him??? A broader view of the room. You can see the tiny table/chair setup and the small shelves set up; so Vincent can put his own supplies and toys away. A "floor" or "childlike" view of some of the shorter shelves that help Vincent keep his room clean. I also LOVE the fluffy rug! It looks so inviting and comfy; I bet any child would have a blast just rolling around on it, especially a baby just learning to roll over and crawl! A bird's eye view of those same shelves from the picture above. You can really get a good look at some of the artwork on the wall now. More shelving (and a mirror!) by the work table/chairs. 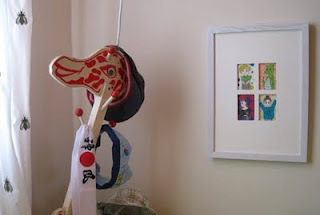 A short, fun rack of hooks; so, toddler learns to put things away but is entertained as well! Another wide-view of the room...the more I see it, the more I love it! So, do I have to guts to commit to this style of nursery? I think I do! Even DH is excited about this style of room; which, in turn, makes me feel even more confident! I'd love to do whatever necessary to give Baby C. a good opportunity in life; and I'm beginning to think that a Montessori room and early education might be a good place to start! Toys are a big part of the Montessori teaching method as well. There are sooo many stores that carry the "learning" toys that are encouraged. 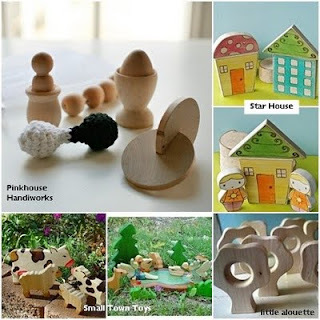 Here are some wooden toys by Pink House Handworks that I found on another blog that looked super cute! Another aspect of the Montessori room that seemed to be stressed over and again, was that of creating responsibility in the child - making them aware of their surroundings and what is "best" and "right". So, for example, teach them that cleaning up their toys or putting their clothes away will make their room easier to live in and therefore more enjoyable for playing. I was thinking of ways to make cleaning up and putting clothes away "fun" when I found the site www.straightlinedesigns.com. These people are so inventive and just plain cool! The cabinets are AMAZING! I would love to get Baby C. the "Beaver" or "Carrot" or "Mrs. Pearson" (heck, ANY of them would be wonderful!) for her room one day! 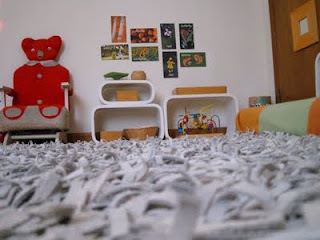 Well, I've definitely got a lot to consider and think about when it comes to whether or not I'm going to jump in and make Baby C.'s room a true Montessori space; but I feel much more confident that if DH and I decide to go this route that we'll be on the right track to doing a bang-up job of it! If you're interested in more information on Maria Montessori or her teaching methods, you can visit Wikipedia's excellent articles on her here http://en.wikipedia.org/wiki/Maria_Montessori and here http://en.wikipedia.org/wiki/Montessori_method. You can also go straight to the Montessori method website here: http://www.montessori.edu/index.html where they also have a way to locate a Montessori school near you! those green chairs are awesome. I know a lady who has two kids one is 1.5 and she just had another one monday and she has the same set of chairs and table. 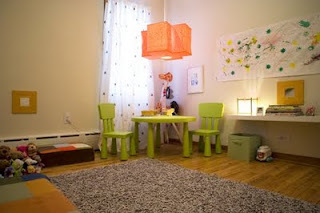 The green chairs and table set is from Ikea. It is called the Mammut set.